﻿Now that the winter has broken and flowers are out in Rochester, and the temperature in the deserts of North America are over 90 degrees each day, the only sensible place to go is the Sonoran Desert. The Minckley lab (Robert, Bob, Roberto, Rob, Adrian and Chan) is headed to northern Sonora for the rest of May and June. No bees are out this time of year, but the perennial plants are. We will be resurveying plants on plots first established in the year 2000 to see how the species composition and cover has changed over the last decade. In 2000, all grazing and agriculture was stopped in this area. We will keep you posted. The pictures are from Three Points, Arizona-a suburb of Tucson. Saguaro cactus (Carnegiea gigantea), left. A Prickly Pear cactus (Opuntia engelmannii), right. 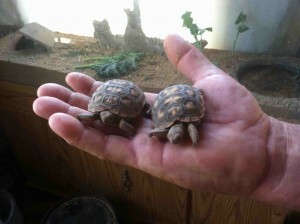 The Desert Tortoises (Gopherus agassizii) were born on 9 Sept 2010. This entry was posted in Field Trips, Research Updates by Rob Laport. Bookmark the permalink.